The famed nineteenth-century poet and rake, Lord Byron, comes to life in a searing blend of fact and fiction, a shockingly brilliant novel with all the hypnotic power of Caleb Carr's The Alienist and the best of Anne Rice. 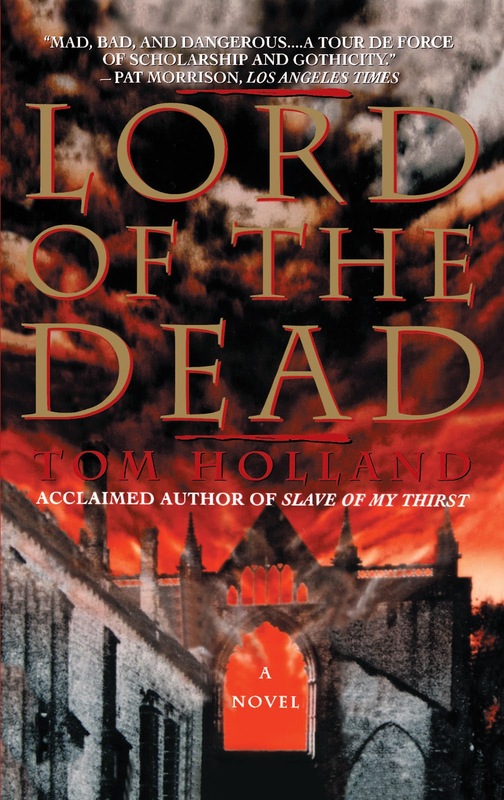 Tom Holland, acclaimed author of Slave of My Thirst, made an astonishing literary debut with this mesmerizing tale. Traveling in the mountains of Greece, Byron falls under the spell of a mysterious fugitive slave, whose pale, slim body arouses his lust. Utterly entranced, his fate is sealed. The supreme sensualist embarks on a life of adventure -- that of the world's most formidable vampire. What a bizarre book! I had it marked as horror while on my TBR shelf. After reading it, I unclicked the horror box and selected gothic. It's truly a gothic story, very similar I'm sure to Anne Rices work. The entire book is a narrative of a past life and history. While this can grow annoying, at least the life led was interesting. Beware that if you're not a fan of Anne Rice type vampires, you very likely won't like this book. It's a slower, psychologically ramped ride. Not a terribly lot is going on in any quick or exciting way, but the easy writing manner and the almost poetic playout makes the text and story seem almost dreamy. In fact, some sections of the book are so surreal it makes you question where the person is dreaming or hallucinating at the time. It's a life story unfolding from the trip Lord Byron takes with his friend and what happens at the end. I was more into the story with the changes that came upon him becoming a vampire. When this shifted quickly with a surprising event, I was aggrieved by something that happened when Byron was made vampire. I still think the story would have been more interesting if it had continued in the way I thought it should, and then evolved from there, but clearly the author had a different roadmap in mind. The ending did make it up to me in a way, though, as it dished out a surprise twist. There were a lot of changes to the classic vampire story here but I don't wish to say them as that would spoil the surprise of the story as Byron himself finds out the true horror of being undead. To give a big change away would point out the tragedy of it's discovery as the vampire - and reader - find it out for the first time. Let's just say it's not a pretty world the Undead live in, and the twist Holland adds is horrible indeed. Byron by himself was an okay sort pre-vamp, but due to his nature and just him in general he's not the greatest type of person. How truly awful it would be to live an existence as they did. I was amused that I read this, then the foreward to my edition of Dracula, to find that the doctor in the book really was at the famous party where Shelley penned the infamous Frankenstein. His book was real too, predating Dracula. Not an amazing piece of literature, but still a good piece of work for someone wanting a different sort of tortured vampire story. When I say tortured I don't mean innocent vampires trying to play nice, they are cruel and matter of fact in this book. The tortured element is just part of the the horrible existence of immortality for this piece. I'm not familiar with Byron's work and this is the first piece of fiction I've read about the author. Really dug the writer's style and it's clear he has talent with the word. Went to look into some Byron poetry and I can see why so many find him talented.